Originally there were two rural schools located one mile north and one mile south of Bolan. 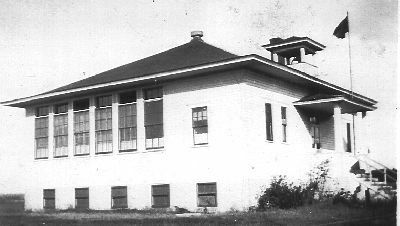 After the south school burned in 1922 the school board decided to rebuild at the Bolan corner and consolidate the two schools into one two-room school. The Bolan church was used as a makeshift school to complete the school year. In the Spring of 1923 the big day arrived to move into the new school. Such elegance! The rooms were large, everything spanking new, including desks and teachers’ desks. There were separate coat rooms for boys and girls. A front entrance sported a fountain, of sorts, that was filled by students taking turns carrying water from Emma Hummel’s well which was nearest. There were indoor chemical toilets and a full basement to play in during inclement weather. A well was drilled in later years. The playground was two acres flanked by pine trees. There were built-in bookcases at the rear of each classroom, with large storage drawers below. Anna Thon (later McCready) was the south school teacher and at the Bolan church. She became the upper grades teacher, while Agnes Torgerson, who taught in the north Bolan school became the 1-4 grades or lower grade teacher. They fired the huge furnace in their basement on alternate weeks. In 1927 and 1928, large classes graduated. There were eight 8th graders in 1927 and at that time Bolan’s population was 75 as most the families were large. If one passed the Geography and Health State Exams in 7th grade and the other subjects in 8th grade, then they graduated. The graduates from 91 schools received their diplomas at either Northwood’s Crescent Park or Fertile’s Rhoades Park. It was held in connection with the County Farm Bureau Picnic. They were the only parks large enough to accommodate such a large gathering at that time. The building was bought at school auction by Art White for $500. He moved it to Bolan where it presently sits to use as the Bolan Store, a grocery and hardware store. He was fatally electrocuted while working on a bin in Bolan, in 1964. Ruth White married George Hansen in 1966 and they continued running the Bolan Store. They went out of the grocery business in 1971. George having been in the John Deere Implement business in Cresco, started selling machinery and sold so many wagons they called Bolan “the wagon capitol of Iowa”. He also sold lots of tile. In 1977, they sold it to four area farmers: Bud Borchardt, Kermit Kuntz, Bob Harman and Almo Jahr. Almo later became the sole owner until his passing in April 2002. Scott & Lori Willert bought the property that fall, and the building became known as the Bolan Schoolhouse where consignment vendors would sell their crafts, artwork, antiques, and other unique products. 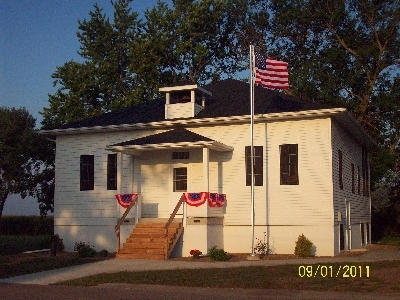 In April 2009, the Willerts donated the land and building to the Bolan Schoolhouse & Cultural Center, which is an eleven-member nonprofit board that organized in September, 2007. The group’s first fundraiser was a box social the following September, and the first significantly supportive grant was awarded in November from the Worth County Development Authority (WCDA) in the amount of $50,000. Restoration and rehabilitation plans were underway! The goal being to create the character and look of an early 1920s two-room 40’ X 40’ schoolhouse, while installing modern-day conveniences in order to provide multiple uses and options for the building. The lower-level serves as a rentable community center meeting place. It could also serve as a weather shelter or place for families to “get back on their feet” after a natural disaster, as it has a shower, washer/dryer, kitchen, air conditioning, and carpet with in-floor heat. The upper-level will be used to display historical memorabilia and artifacts, part of which will be the educational history of the school spanning 1923 – 56, including the 1940s 18’ x 10’ stage curtain / advertisement banner with 29 local businesses advertised on it. Programs will be hosted and possible a gift shop area will sell local artist and craft work. Present Board Members include: Gordon Allen, Marena Bartz, Dorothy (Weieneth) Bratrud, Connie (Olsen) Bruesewitz, Jeff Greve, Brian Kenison, Joe Nydegger, Lindsey Kenison-Severson, Mary (Steiger) Wendt, Lori (Nydegger) Willert, and Phyllis (White) Young. Former members: Shea Kruger, Nicole Schotanus, Fred Langrock, and Mike Urbatsch. Copyright © 2008 Worth County Historical Society. All Rights Reserved.